Hello to all those who love to read books! I often read books from people's recommendations, so don't be afraid to share some of your favourite reads in the comments section! This week I've been reading Mr Penumbra's 24 Hour Bookstore, which was a recommendation from Literary Lindsey. I downloaded the book to my iphone, which is funny because that's exactly what this book is about, old technology versus new, and how much computer technology has taken over our lives. The story is about Clay, who works the nightshift in an unusual bookstore which has about one customer each night, and runs more like a library than a store. Odd characters come in, borrowing huge, old books, and Clay enlists his computer savvy friends to help him work out what is going on, leading them to a code-breaking cult searching for the secret to immortality. and Harry Potter fans. It reads more like a young adult book, in that it is quick and light. If you love a story about breaking codes, you'll love this one! The writing is not exactly poetic or challenging, but I love the way the epilogue is written - clever! In other news, my mum found me this ancient, falling apart book of Alice in Wonderland, and I've been enjoying the coloured plates, wondering if I should take them out and frame them, or just keep the book as is. Hmmm...what would you do? 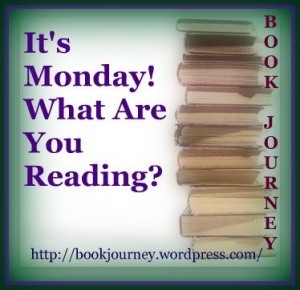 Now I'm off to visit Sheila and all my other book-loving friends via Book Journey's linky party! I love to read, I'm such a bookworm! Currently just starting an autobiograpy - Victoria Pendleton. Also just finished a brilliant book - Gone Girl, really enjoyed it! That's a gorgeous edition of Alice - I wouldn't want to mess with it, but it definitely deserves to be shown. I'm reading (listening to on audio) Some Kind of Fairy Tale (Graham Joyce). I reread Alice in Wonderland a couple of years ago, and really missed the lovely illustrations that were in my childhood book (from the library, I think). Yours above looks just like my childhood favorite. Thanks for sharing. 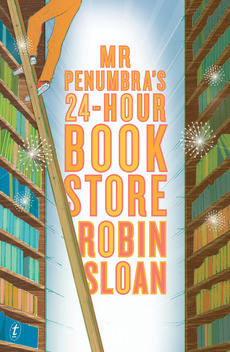 I like the idea of Mr. Penumnbra's 24-Hour Bookstore. I can't wait to read Penumbra, I've heard so many great things about it. Oh my word, look at that gorgeous book! Alice is one of my all time favorites :) I don't know if I could stand to take pages out even though I wouldn't blame you for wanting to frame that beautiful art. Yes, yes, yes -- I love book suggestions! I haven't heard of this one but I can't wait to check it out. Well, it's pretty much like reading about Harry, Hermione and Ron as computer wizards, working for Professor Dumbledore in a bookshop, lol! My Mum for a start! Only trouble with reading books on my iphone is I'm not getting to pass the books onto her, as I've always done. Oh well, she'll never be short of books anyway when she finds them for a buck or two at her local thrift store, lol! Hi Wendy, found you through Blogtoberfest, and I'm a reader! Love books. Just finished "The Messenger" by Markus Zukas, which I thoroughly enjoyed. Bit of a tricky question - to pull pages from a book or not, I think it depends on how bad a condition the book is in? That book sounds interesting, think I'll add it to my list. Gorgeous Alice illustrations! What a find. I'd be tempted to frame them if the book is already falling apart. Right now I'm reading Harlow in Hollywood - LOVE it!